Lately I’ve been craving two things: greasy, oh-so-terribly-bad-for-you nachos (with a huge amount of guacamole) and tuna steaks. Since my Weight Watchers weigh in is tomorrow and I’ve been doing so well (reduced 5% of my weight in 3 weeks) I went with the less amazing alternative – the tuna! I kid, because the tuna I ended up coming up with was actually really delicious. My point is that nothing compares to those delicious, delicious nachos (I’m saving those (and my extra points) for the Superbowl this weekend). I served the tuna over spinach and we had a side salad. Add vegetable broth, lemon zest, lemon juice, herbes de provence, garlic salt, 1 tsp olive oil, and 6 sprays of “I can’t believe it’s not butter” spray to a large bowl with the tuna steaks. Rub the mixture on the tuna. Add the tuna to a hot griddle or pan. Cook approximately 2-3 minutes on either side until cooked through. Once tuna is cooked, add the sauce from the marinade to pan to cook the sauce through. In a separate pan, add the remaining 1/2 tsp olive oil and 2 sprays of “I can’t believe it’s not butter” spray with 1/3 cup of water. Add the spinach and saute until spinach has wilted down. 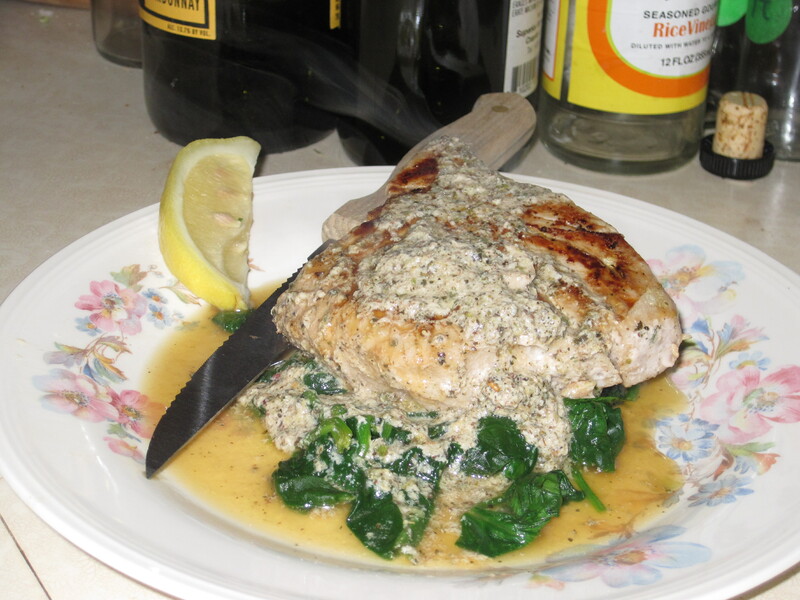 Serve tuna over spinach and spoon sauce on top of the tuna. I served it with a small lemon wedge but it already had a pretty good lemony taste.